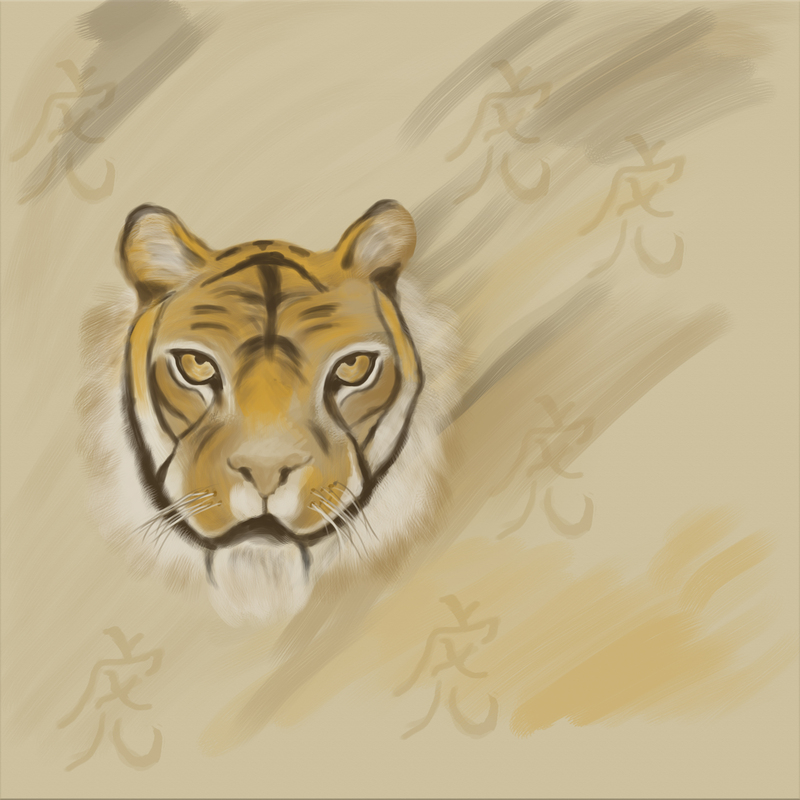 “Karate Tiger Fighting Spirit” – On Sunday, while I was waiting for my Linux system to update, I decided to play around with graphics drawing with Photoshop. Drawing on Photoshop can be awkward, especially when you are use to looking at the drawing from the perspective of looking down on a piece of paper or canvas. Drawing with a tablet system forces you to look at the monitor, while attempting to make nice strokes with the pin on a blank mouse pad like surface. You cannot look at the pad and pen, you just have to rely on the mouse icon to show your orientation. Not very easy, I take my hat off to people that do movie and cartoon animations with this method. If I had the money I definitely would purchase the drawing tablet that has a monitor built into it. I use to have a Wacom Bamboo tablet, but it fried under a serious power surge a while back. My computer was fried as well, so I got a new system. Since I was trying to recover from the loss, I had a budget that I was trying to stay under, this caused a dilemma of purchasing a replacement Wacom Bamboo, because retail price for one is still about $200.00. I could not see myself to spend that kind of money again for something I use on rare occasions. Fortunately, my wonderful wife, found a tablet device on Amazon.com for like $70.00. The device is called a Huion Tablet. Its a Chinese developed tablet, meant to compete with Wacom products. Wacom has always been a leader in tablet technology, but Huion is really a nice product. You really get a bang for your buck, the Huion tablet is almost 2.5 times the size of the Wacom Bamboo, has builtin smart buttons for different functions, fully configurable hot zone buttons. Overall I am really impressed with the product. Really recommend it to anyone that wants to draw graphics on a computer. Now, back to the drawing, I decided to draw a theme for a possible upcoming website design that I am toying with. I wanted to capture oriental martial arts fighting styles. So the first one, is Tiger style. So I drew an image of a tiger and the kanji for tiger as well. Total time was bout 2.5 hours. This entry was posted in Animals, Tigers by Jacob Cottingham. Bookmark the permalink.